G Suite For WHMCS will enable all G Suite Authorized Resellers to provision and manage Google accounts in their very own WHMCS system. 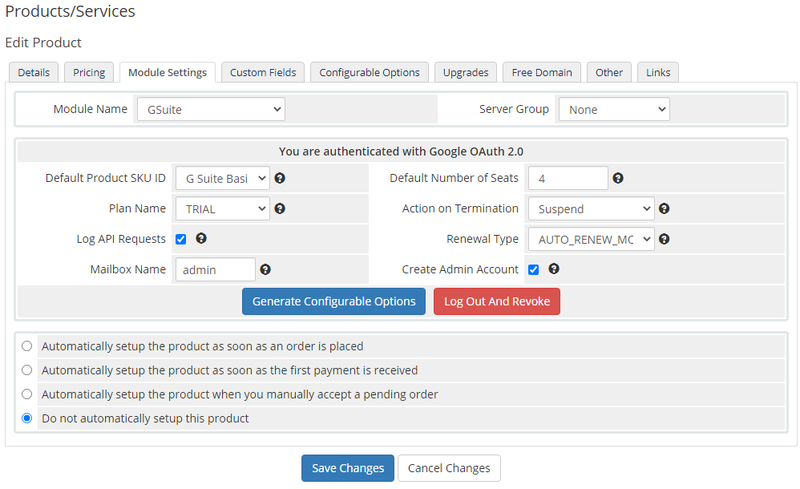 Authenticate through OAuth 2.0, create flexible products and let your clients order ready Google services directly from your website. 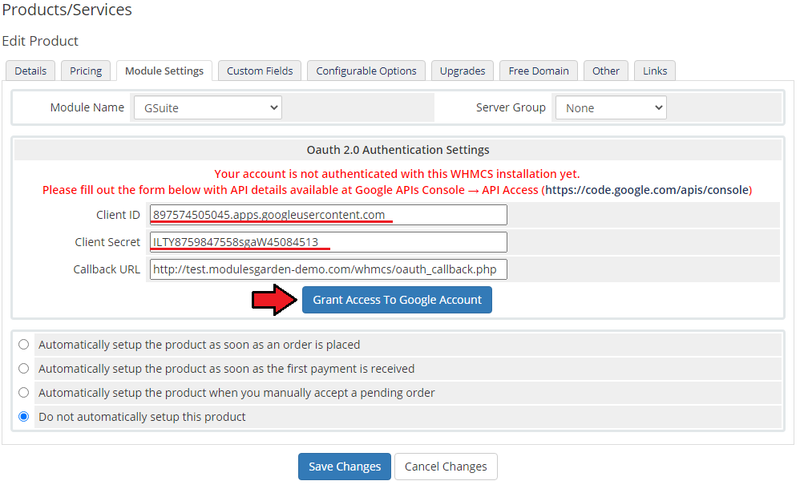 This tutorial will show you how to successfully install and authenticate G Suite For WHMCS. We will guide you step by step through the whole installation and authentication process. 4. When you install G Suite For WHMCS for the first time, you have to rename the 'license_RENAME.php' file. The file is located in 'modules/servers/gSuite/license_RENAME.php'. Rename it from 'license_RENAME.php' to 'license.php'. 5. In order to configure your license key you have to edit the previously renamed 'license.php' file. Enter your license key between the quotation marks as presented on the following screen. 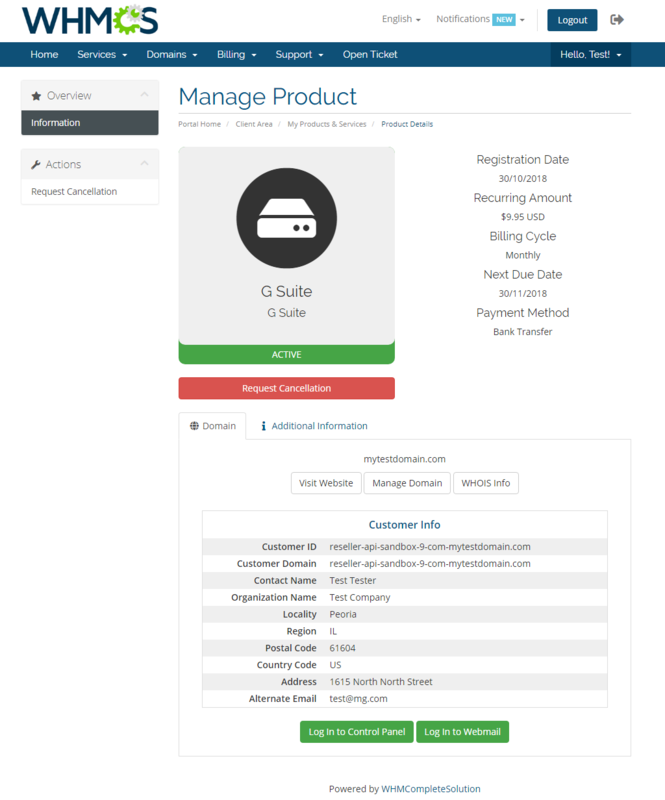 You can find your license key in our client area → 'My Products'. 6. 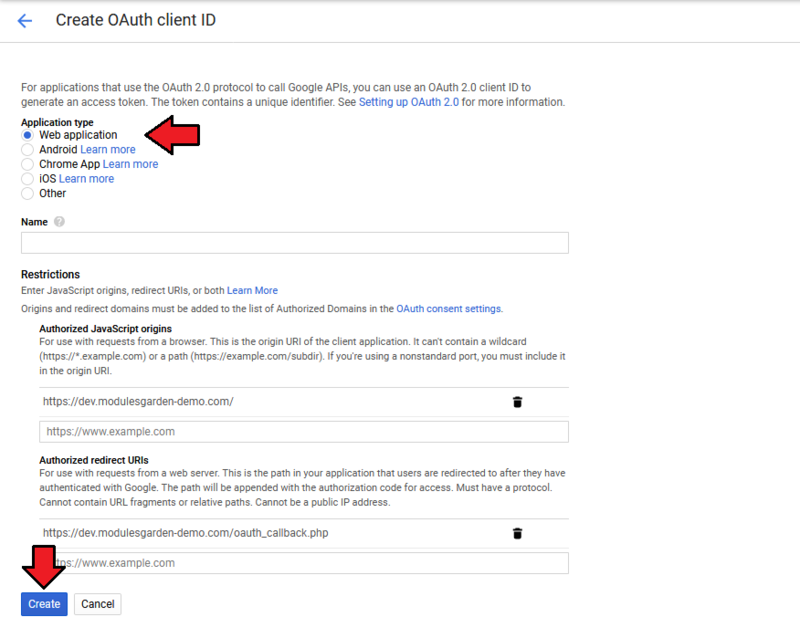 Now you have to authenticate the module through setting up the API Access. 7. After you have logged in, create a new project. 8. Open the 'Explore and enable API' section. The API & Services page should open. To start, go to 'OAuth consent screen' under the 'Credentials' section. Afterward, enter the mail address and application name that will be visible during your requests. Save changes through pressing the 'Save' button. 9. To proceed, go to 'Google APIs' under the 'Overview' tab. Find 'Google Apps Reseller API' among the applications. 10. 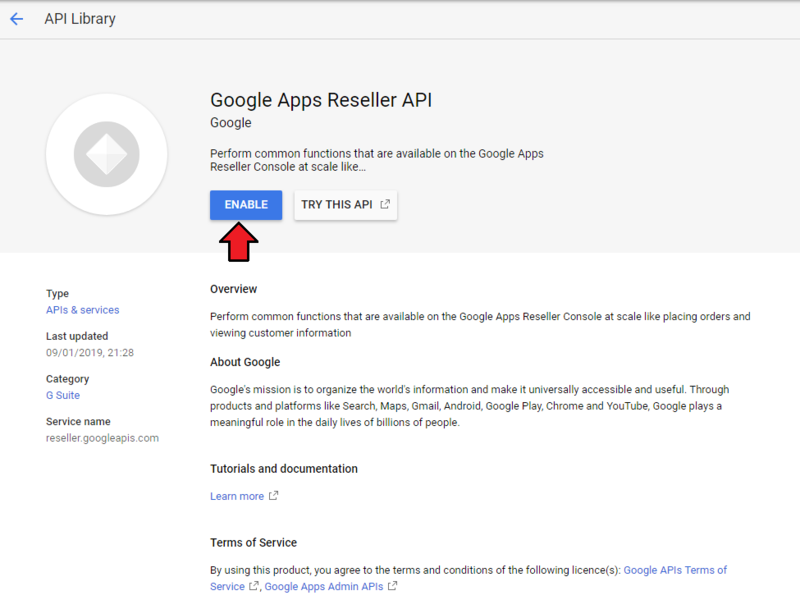 Now, you have to enable 'Google Apps Reseller API' as shown on the following screen. 11. 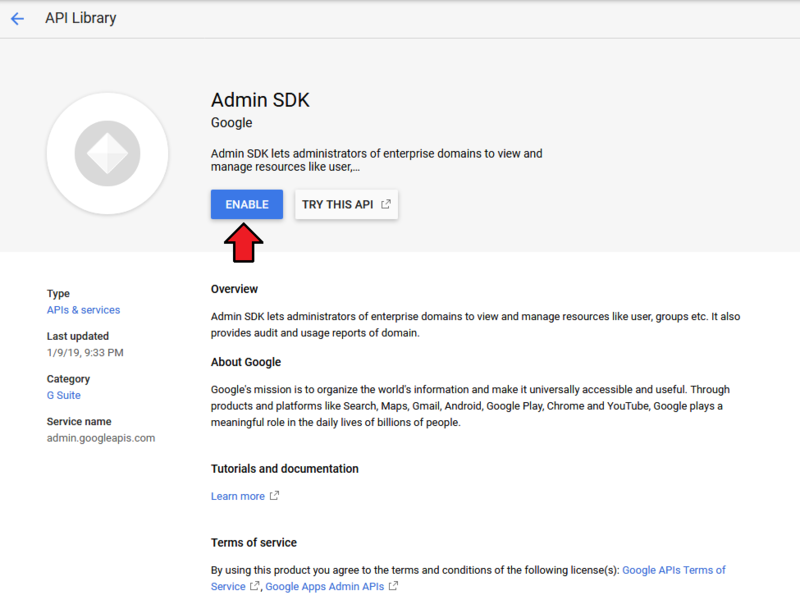 Next, search for the 'Admin SDK' the same way you didi it in step 9. 12. Enable 'Admin SDK' API. 13. Then, switch to the 'Credentials' tab and add new credentials . 14. After you have done that, tick 'Web application'. Confirm changes through pressing 'Create'. 15. Well done! 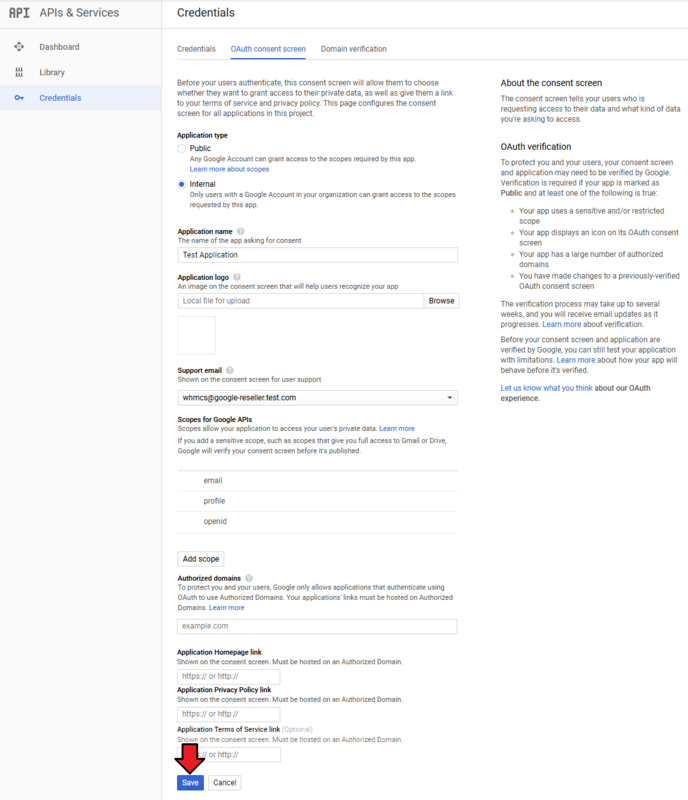 Now that you have filled in all the necessary details, you can proceed to authenticate Google Apps. 16. 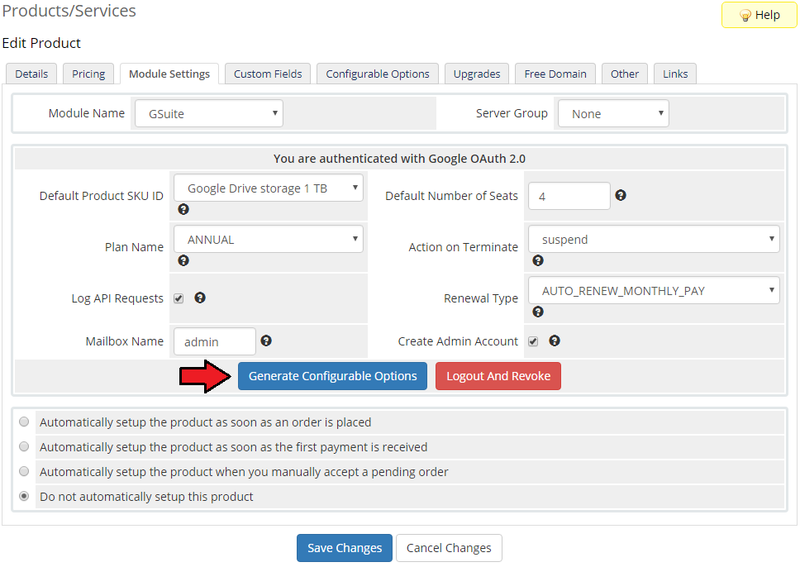 Go back to your WHMCS system and create a new product for your GoogleApps. Move to 'Setup' → 'Products/Services' → 'Products/Services' and add a new product. 17. Choose the desired product type and product group from the dropdown menus and enter a new name of your products. Press 'Continue'. 18. 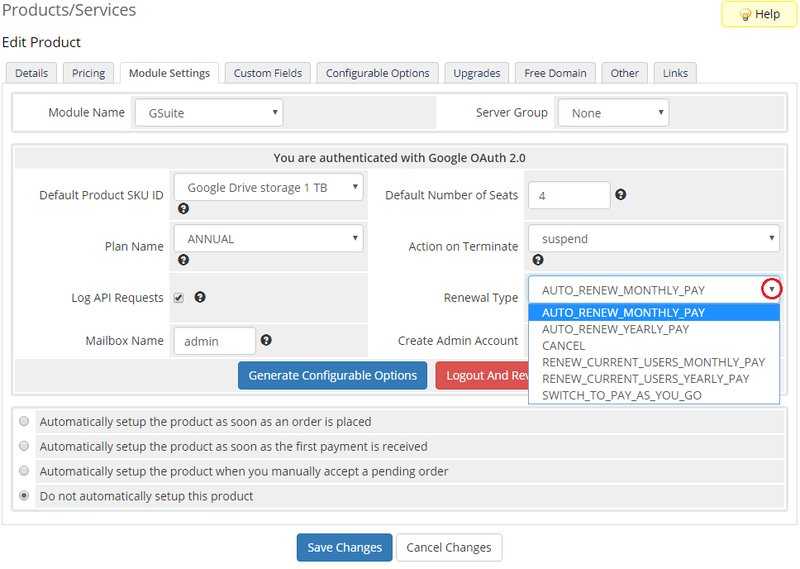 Go to 'Module Settings' of your product and choose 'G Suite' from the 'Module Name' dropdown menu. After choosing the module, make sure to click on the 'Save Changes' button. 19. Enter your previously obtained 'Client ID' as well as 'Client Secret' and make sure that 'Callback URL' is correct. 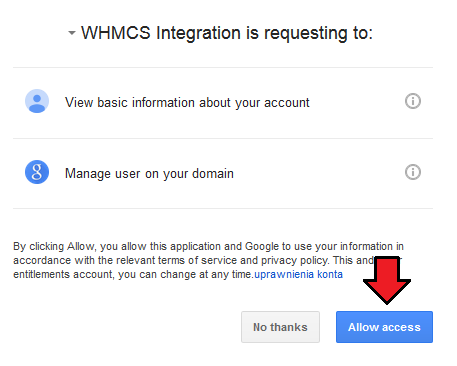 Then, press 'Grant access with Google account'. 20. If the data you entered is correct, you will be redirected to the page with permission request. Press the 'Allow access' button. 21. That is it. You will be now redirected to your WHMCS and you will see the following screen. 22. Now, let us move to 'Custom Fields'. 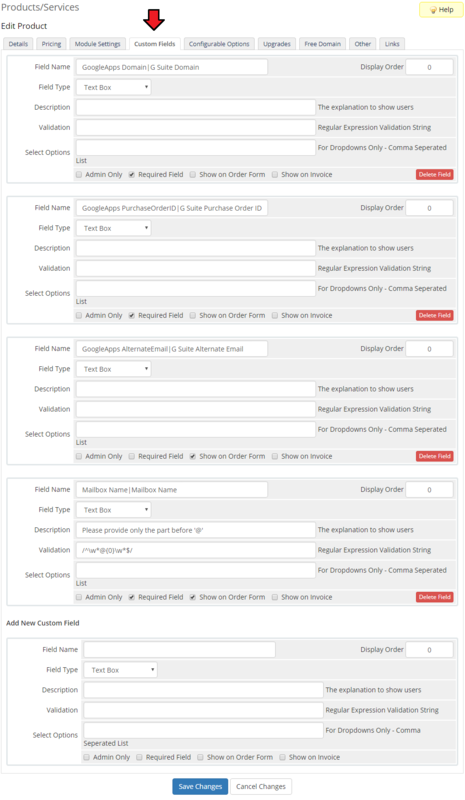 Fields with 'GoogleApps Domain' , 'GoogleApps PurchaseOrderID' , 'GoogleApps Alternate Email' and 'Mailbox Name' variables are added automatically. Note: Since 1.3.0 module version you are free to adjust the 'friendly' name part after |, but remember not to change the first part, which is a variable. 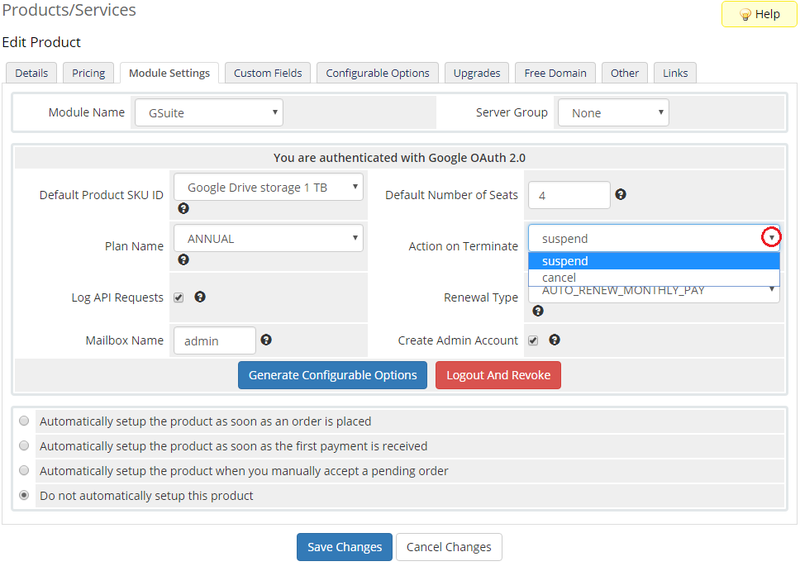 Configuration and management of G Suite For WHMCS is very intuitive. Read the below sections to see how easy it is. 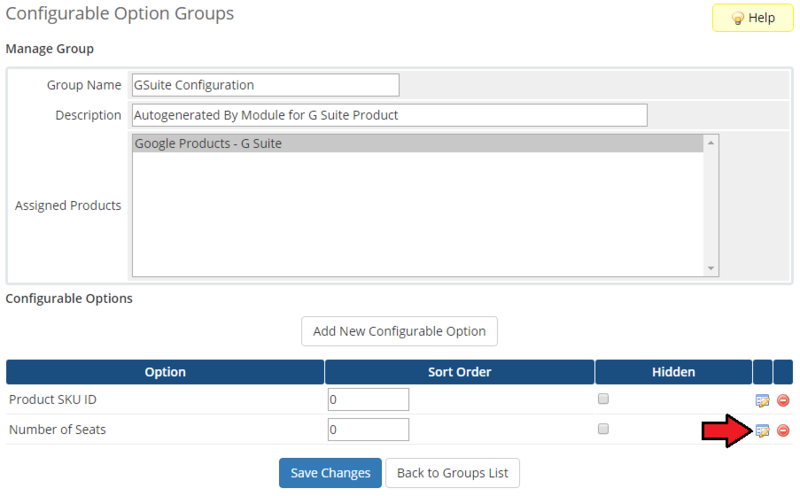 Let us begin the process of module configuration by choosing Default Product SKU ID. To start with, simply pick one of the available Google services. 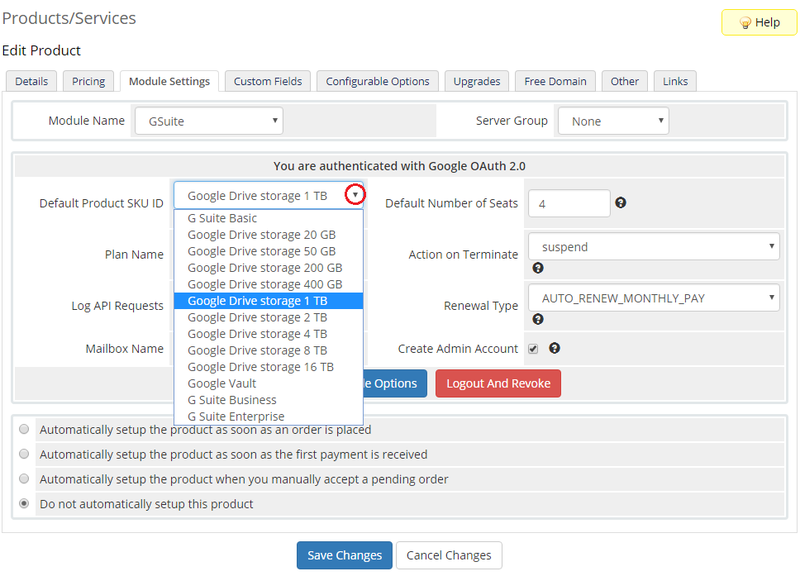 As you can see on the following screen, our module supports G Suite Basic, G Suite Business and G Suite Enterprise, as well as Google Drive Storage and Google Vault. Note: Since the 1.1.5 version of G Suite For WHMCS module, the ANNUAL plan is equivalent to ANNUAL_MONTHLY_PAY in G Suite API. Action On Terminate - here you can decide whether you want to suspend or cancel customer services upon the termination. 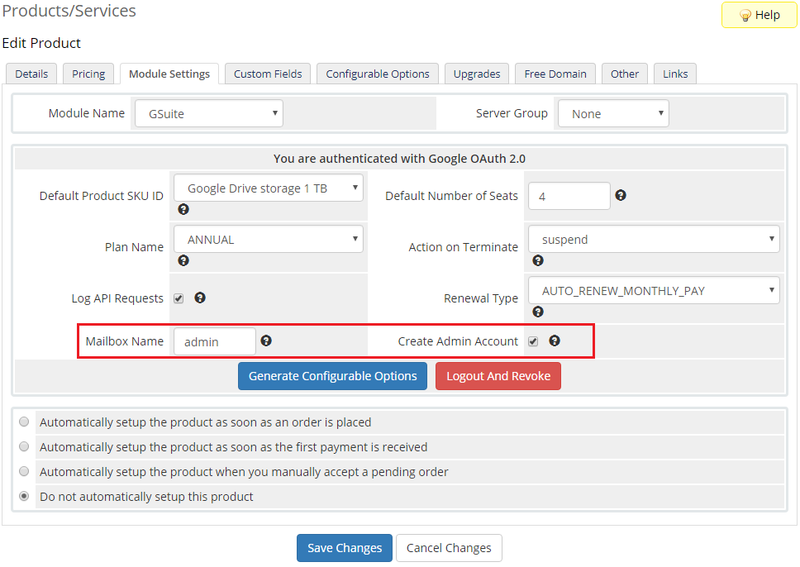 Create Admin Account & Mailbox Name - select this option to automatically create an administrator account with a given username for the G Suite domain. In order to automatically generate configurable options, simply press the button marked on the screen. 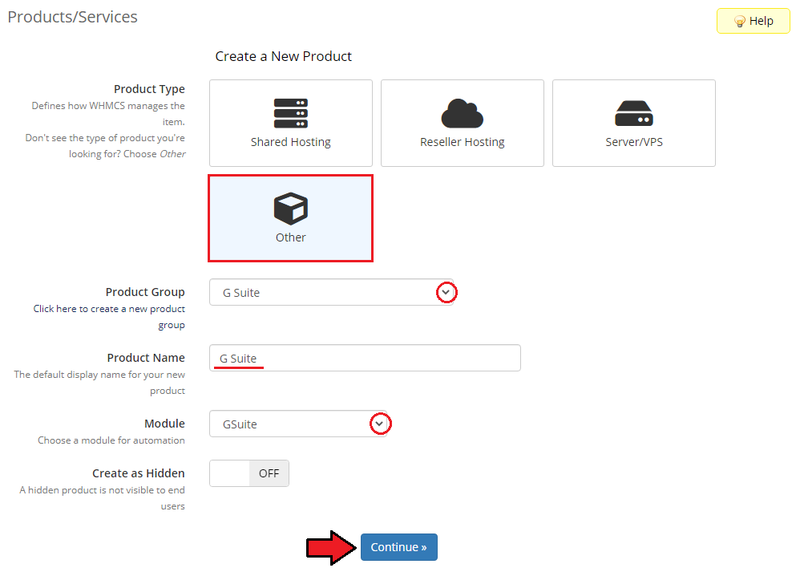 In your WHMCS system press 'Setup' → 'Products/Services' → 'Configurable Options'. Find the 'GoogleApps' options on the list. Here you can manage and alter added configurable options. Provide values for your new option and enter the desired price. Press 'Save Changes'. In the 'Module Settings' tab of your product you can fill out the fields for ' Default Product SKU ID' and 'Default Number of Seats. Remember however that these values will be used only if configurable options are NOT generated. From now on you can easily and quickly change value of your product. Remember that you can add more configurable options for other values. Let us check your new product on the product page in admin area. It should look like on the screen below. This is how the module will be displayed in the client area. 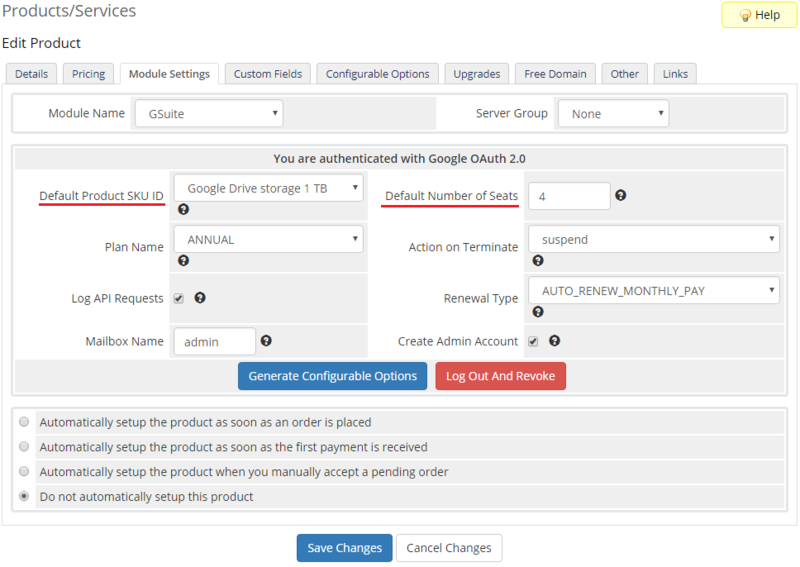 G Suite For WHMCS also allows your customers to quickly access Google account services. You can link existing customer accounts by filling in the Custom Fields: 'GoogleApps Domain' and 'GoogleApps PurchaseOrderID'. 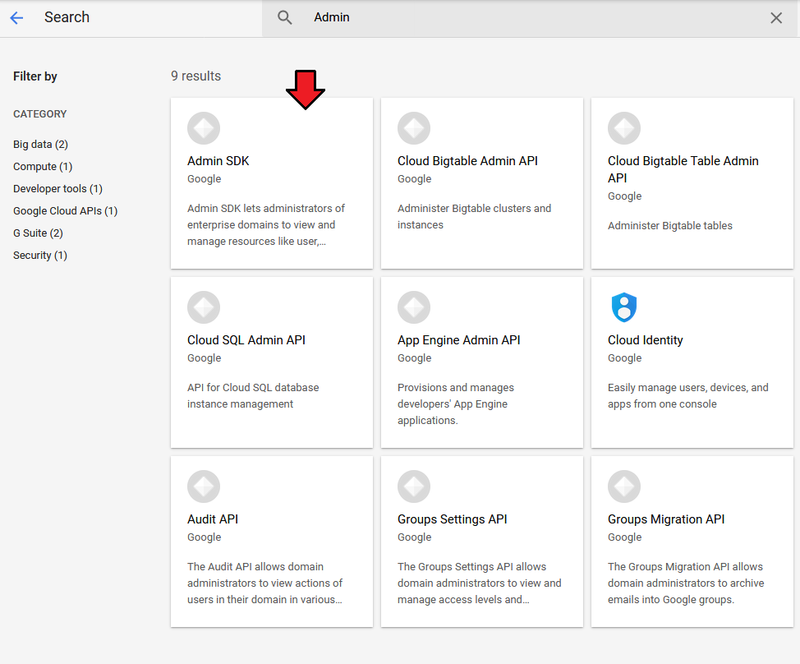 After your customers order a new subscription, they should insert their primary Google account domain name in the 'GoogleApps Domain' field. Then, the new subscription will be added to that account. 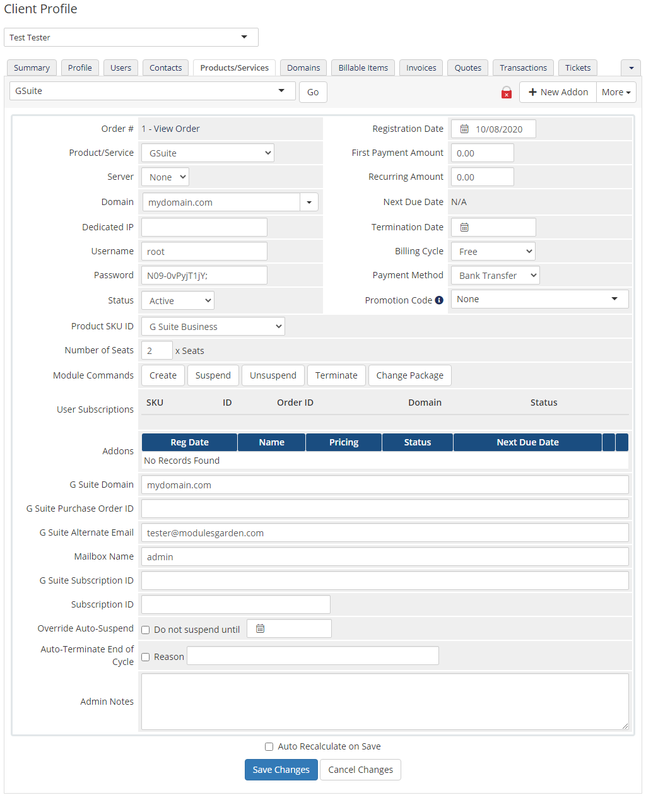 If you want to manually create an order for existing subscription, in addition to the above steps, you need to find 'Purchase Order ID' (usually on the invoice). Copy the ID and paste it to the 'GoogleApps PurchaseOrderID ' field. Afterward, do not run the create command but just press the 'Save Changes' button. You can also change the status to 'Active'. 1. 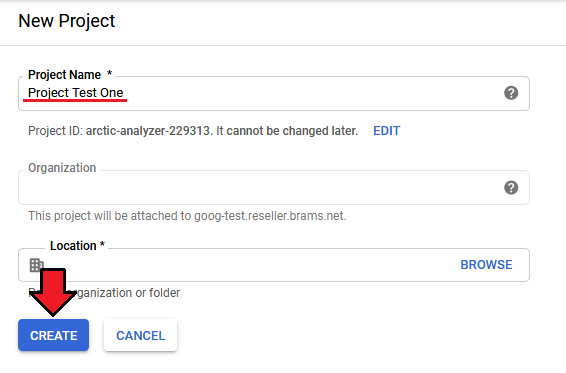 Our module requires a G Suite Reseller account. 2. Avoid using localhost and Raw IP during the authorization. 3. Callback URL is fetched from your WHMCS System URL. You can set it in the 'General Settings' of your system. 4. 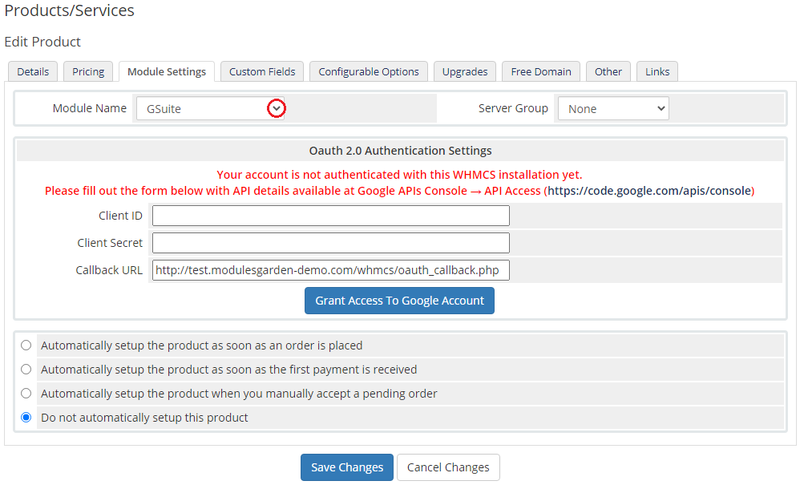 To change your API access and OAuth, go to product configuration page and add &logout=1&revoke=1 to the URL. 6. Some API actions such as 'suspend' may be subject to additional restrictions or have different results depending on the selected plan or the number of days elapsed. 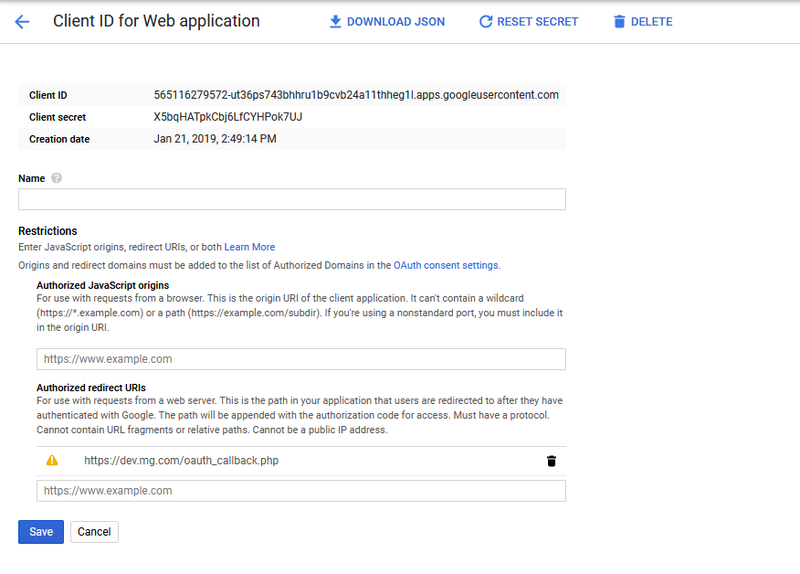 If such a case, make sure that URLs provided in Google account and your WHMCS system are the same. Keep in mind that addresses with the prefix 'www' vary from addresses without this prefix. 3. In case you encounter error similar to the one below, you most probably disabled the output buffering in the PHP configuration. Notice: ob_clean(): failed to delete buffer. To solve the problem, please set the 'output_buffering' value to 'On' in the php.ini file. This page was last modified on 28 February 2019, at 15:49.